These 3 puppies sisters are so incredibly small and adorable but they were given up right before the Holiday and after losing their family and their home there is a great chance they will also lose each other. They need a Holiday MIRACLE, Please SHARE and hopefully someone will see this and be able to save and love all 3 of them, they have been through so much. A FOSTER or Adopter would save them. Urgent! another 3 puppies all 4 months old! dumped in drop box! unbelievable! heartless cowards! not sure if together, please help all will be killed Tuesday! this cruelty never ends, please help them please! Please help these 3 lab puppies, 2 boys 1 girl, just 4 months old! all dumped in the drop box! heartless pathetic cowards! 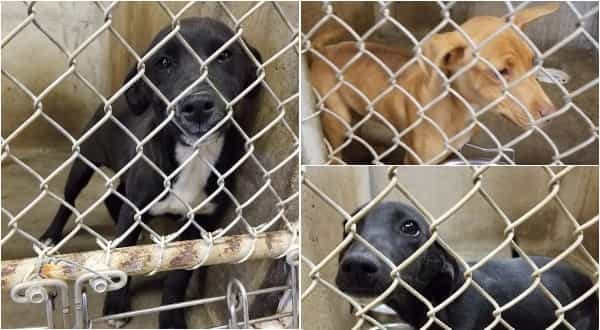 not sure if all siblings, but all same age, whoever can do this has no heart or soul, precious innocent puppies, they will all be killed on Tuesday! they have $0 pledges, no time or hope, please help them and please pledge separately, in case they get adopted or rescued, they are so urgent! this is totally heartbreaking. 2 Responses to "Bonded puppies trio watches their family as they leave them behind at deadly shelter"